Movie theater in the sky? BusinessWeek recently exposed a new trend in the airline industry — designing custom interiors for new, wide-body aircraft (Airbus A340, Boeing 777, etc.) that have come to market recently. 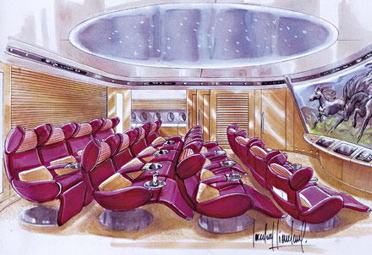 Pierrejean completed this concept sketch of a 16-person movie theater for an unidentified Middle Eastern client who is considering buying an Airbus A380, the double-decker jumbo jet scheduled for a debut next year. Needless to say, here at Cinema Treasures, we plan to purchase several of these.